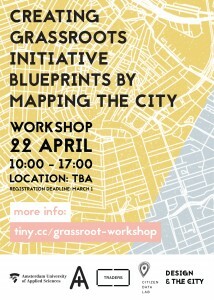 For the Design & The City Conference, Citizen Data Lab (HvA) in collaboration with TRADERS (researcher Naomi Bueno de Mesquita) will host the workshop Creating Grassroots Initiative Blueprints by Mapping The City. You are invited to participate in this workshop which will take place on April 22nd 2016 from 10 a.m – 5 p.m at TBA in Amsterdam. 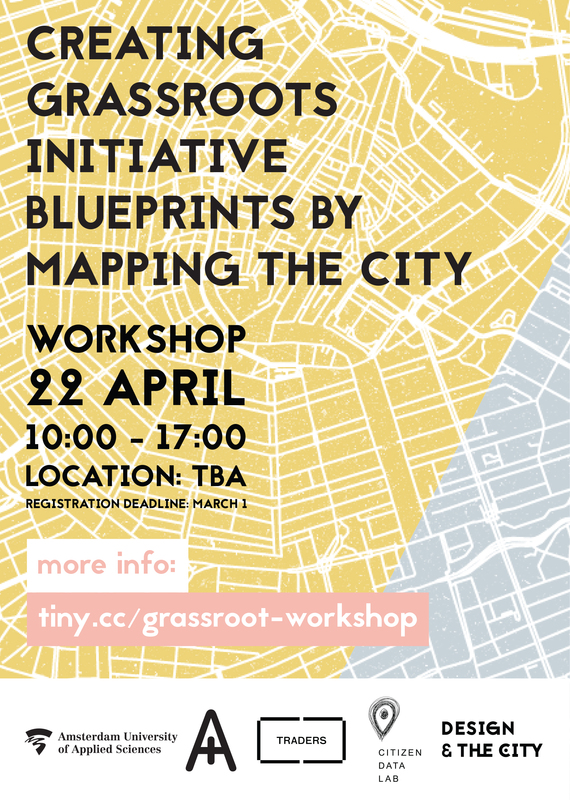 In the workshop, the tool Measuring Amsterdam will be explored and a co-creation session will be held in which the collectively retrieved datasets will be explored as a valuable approach to set up/enable grassroots initiatives on a neighbourhood scale. The blueprints contain elements that are needed for locals to start an own grassroots initiative or they can be used to kickstart an already existing initiative. The blueprint can help recognise stakeholders involved and it can function as a basis to create a story (working with a narrative around a specific issue is important when striving for participation in setting up grassroots initiatives). We will discuss the kinds of data-sets that the tool produce and what other datasets are interesting to implement to improve the story. Last but not least, we will discuss other similar initiatives. You can register for this workshop by going to the following link. Registration fee is 25 E.
Looking forward to seeing you on April 22nd!